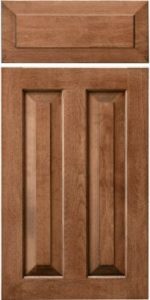 The CRP-10102 door is simply a double panel door with a raised (or flat) center panel. Care must be taken when choosing this door because many narrow doors in a kitchen can’t be made with 2 panels. We will assist you in determining which doors should be made a single panel when we assess your order.